Spain, officially the Kingdom of Spain is a country and member state of the European Union located in southwestern Europe on the Iberian Peninsula. Its mainland is bordered to the south and east by the Mediterranean Sea except for a small land boundary with the British Overseas Territory of Gibraltar; to the north by France,Andorra, and the Bay of Biscay; and to the northwest and west by the Atlantic Ocean and Portugal. Spanish territory also includes the Balearic Islands in the Mediterranean and the Canary Islands in the Atlantic Ocean off the African coast. The Balearic Islands is divided into Gimnesias in the North : Mallorca , Menorca , Cabrera and Pitiusas in the South-West : Ibiza , Formentera . 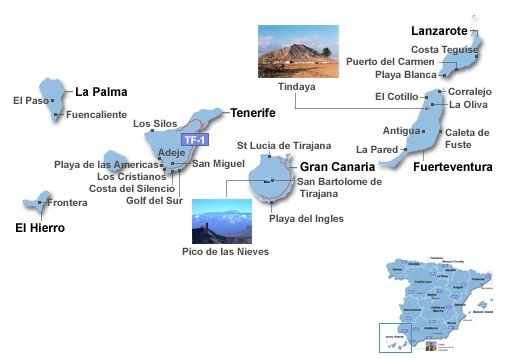 The Canary Islands consists of seven larger Islands : Gran Canaria, Fuerteventura, Lanzarote, Tenerife, La Palma, La Gomera and El Hierro.